On what looked to be the first real day of summer in NYC, I made my way to Gallatin Galleries, part of New York University, just blocks away from Washington Square Park. 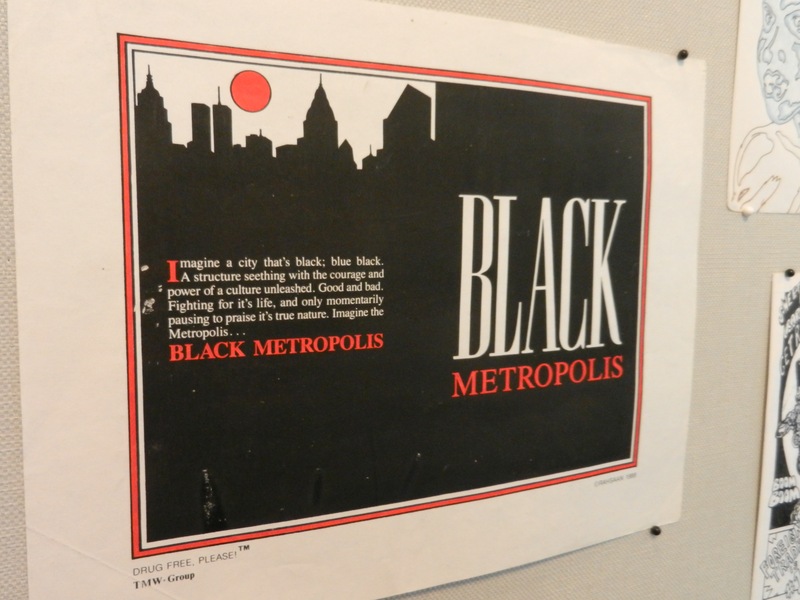 I went to check out Black Metropolis, a 30 year retrospective of creator, artist, teacher and all around digital maestro Tim Fielder. If the name sounds familiar it’s because he’s one of the brains behind Afrofuturefest, creator of Mattys Rocket, and a Ted X speaker. 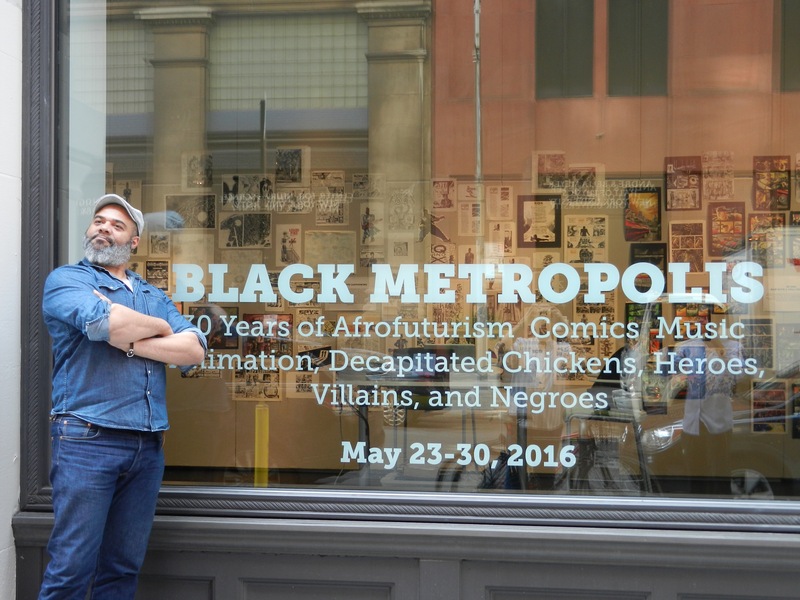 A long time artist, Fielder came to New York in December of 1986, and as of late has been part of this current Black Comic Renaissance that has been blessing the Bleek community these past several years. As I walked into the gallery, I saw that Fielder was the center of a digital media whirlwind, taking care of last minute details, constantly checking texts, answering Facebook messages with other creators and setting up tweets, making sure Thursday’s reception was well attended, ensuring his twin brother Jim picked up their Dad, as he flew in for this exhibit, and trying to work an extra day out of NYU because of the Memorial Day weekend. He was incredibly gracious with his limited time as we talked about his career, art technique, comics and how humanity would adapt to drastic environmental changes, but that’s for another article. “Tim Fielder is a double threat. Not only is he one of the loudest cheerleaders of the afrofurist movement, he’s also one of it’s most talented creators. He is blinding light of positivity and support that is guiding the way for so many of us.” – David Walker, writer of BadAzz MoFo, PowerMan and Iron Fist and is collaborating on a super secret creator owned project with Fielder. “Working with Tim Fielder is like being at the center of the Big Bang. 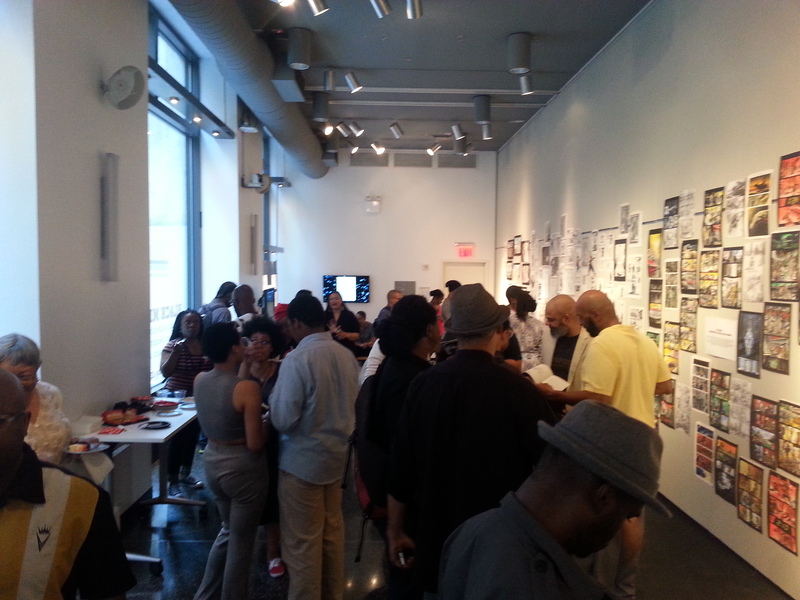 He explodes with ideas, imagery, and a genuine desire to create exciting and insightful material. Working with him is never dull.” -Alexander Simmons, writer and creator of BlackJack. As an artist myself it was refreshing to hear him talk about the passion he has for working digitally, his techniques on creating Matty’s Rocket, and future plans for stories that blend live actors with digital elements to create that retro space age style, like those on the gallery display monitors. Another benefit is the output of his productivity that working digitally grants him. 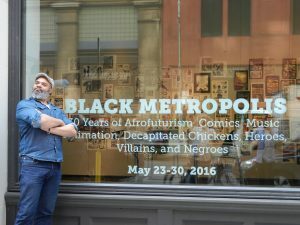 “Even though representation, people of color in comics, indie art and afrofuturism are all trends right now, this exhibit shows that Tim Fielder has been quietly dedicated to those mediums for the past 30 years, building a foundation for all of us.” – Karama Horne aka theblerdgurl, is also an AfroFutureFest partner. 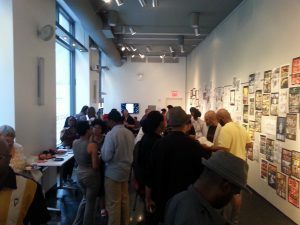 On the horizon for Fielder; plans for a MFA program after graduation, AfroFutureFest will return to New York Comic Con, just a few details left to fall into place and a big announcement shortly. Matty’s Rocket is on issue 2, with issue 3 in process, he will start once he is done with the Black Metropolis exhibit and plans to continue releasing it every 3 to 4 months. Working on Blackjack rekindled his desire to do a black male lead so he is revisiting an old project titled Rix, a sci-fi police procedural set in the future. And if you’ve missed the show, he plans to have everything digitally scanned and photographed to create a book of the show. You can support and follow him on Twitter, Facebook and Tumblr. George Carmona 3rd is an Artist/Designer, former Milestone Media Intern, former DC Comics paper pusher, book lover, lifelong comic geek and still thinks Winter Soilder is the best Marvel movie. You can find his work at FistFullofArt.com or follow him on twitter at GCarmona3.